It goes by many titles: sucrose, lactose, dextrose, fructose, glucose. By any other name though, it would taste just as sweet. It's sugar. Perhaps seeing a solid stream of it pour into his morning coffee tickled something in Bart Bonte's mind. Perhaps he's a designer who can find inspiration in anything. 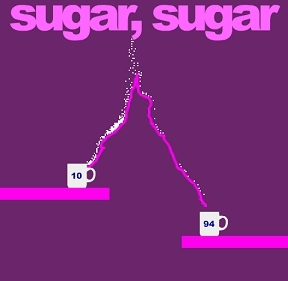 In any case, his new simple idea physics game Sugar, Sugar is all about directing those tiny delicious crystals into a multitude of mugs... and oh, honey, honey, I'm so happy I'm not a diabetic. On each level, a cascade of sugar will pour from the spout of the title's comma. 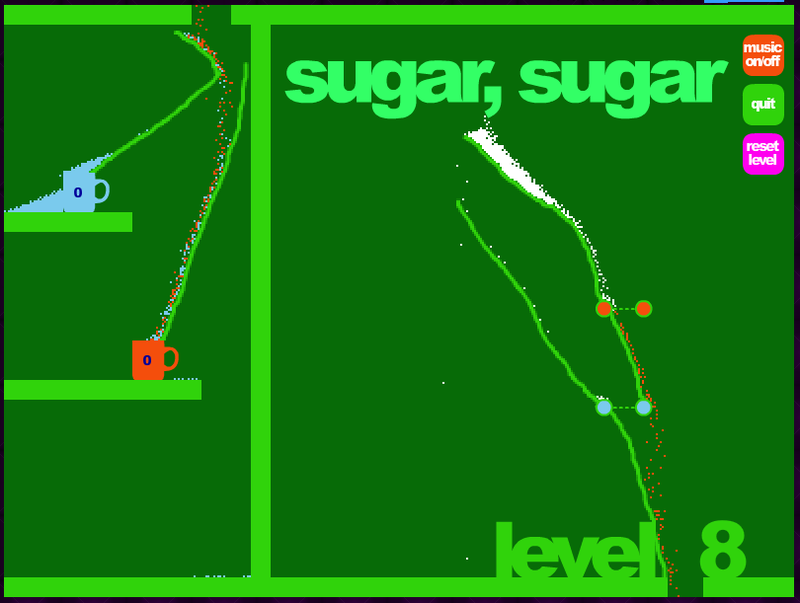 Using your [mouse], you must draw ramps to direct a certain amount of sugar down into the labeled cups. Steep ramps make it go faster, while the shallower ones make it more likely to pool. Some mugs need sugar of a specific color, requiring you to direct it through a colored filter (though no penalty is given for putting the wrong color in the wrong cup). Others require you to hit a button to reverse the gravity of the situation. 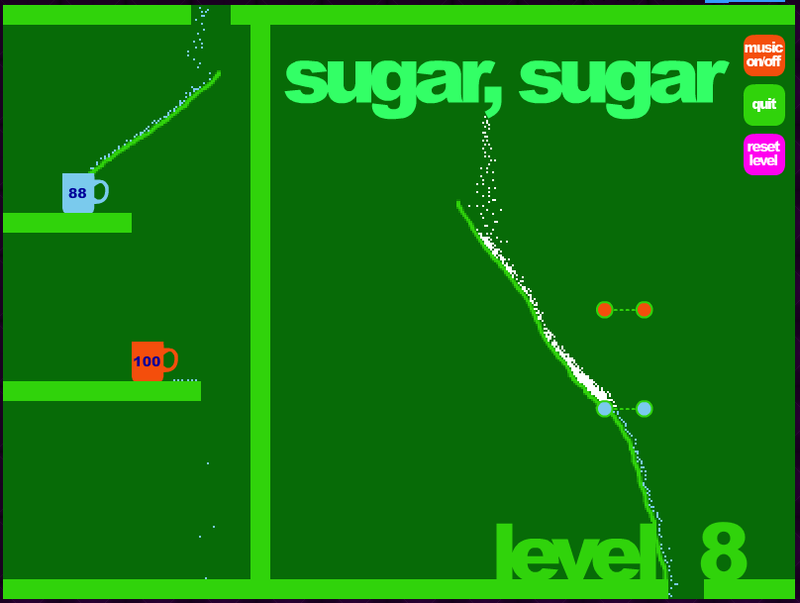 Some levels have a gap in the bottom in which sugar that drops will appear again at the top, and so forth. A reset button is available if you've misplaced your ramp (though sadly no pause button). There are 30 levels and a freeplay mode to unlock... Sweet! Sugar, Sugar is a game of patience. Don't go in expecting anything too fast: The pace is slow, almost meditative... sort of like a Powder Game installment with objectives... You'll find it dull if just trying to speed-run the levels. The enjoyment comes from careful planning, contemplating the flow, and chilling to the music. It isn't perfect: an option to speed up the flow would've been well appreciated, and I disliked how an untimely swerve of the mouse while drawing a line could force me to restart. Still, there is the uniqueness that one finds in all of Bonte's games. In other words, while Sugar, Sugar might be too slow for some, others will definitely find it a cavity-free treat. That's a comma, not an apostrophe. A comma (,) goes below the letters; an apostrophe (') goes above them. A little fast forward button would be lovely. There's sugar everywhere. I feel like my mother should be yelling at me. lol, but seriously, I think this game is pretty fun. I got through most levels with a little inginuity, repetition of similar patterns, and sometimes brute force. Sorry for the double post, but I just wanted to add that I love how polished and easy to play (or at least get the hang of) all of Bart Bonte's games are. A great mix of simplicity and ingeniousness. Only issue is that old flash bug, when moving outside the game window release the mouse button, it will not get it. So more than once I ruined a perfect level with one of this accidental sweeps. Great game, I'm stuck on 19 though, help anyone?! I could do it with a limitless supply of sugar, but I can only get one cup full before it runs out. I'm also stuck on level 19... Help please? Level 19, if it falls through once it gets purple, twice green, threce blue and quadruple red. Now just grap stream after strep from left to right into the cups. Thank goodness Bonte doesn't take cream in his coffee. 19 was a tricky one. You have to fill the red, then blue, then green, then purple or it'll be hard. Essentially, get a ramp that dumps everything into the middle, then have another ramp that picks most of it up and carries it to red (make sure you leave a gap between that ramp and the red cup). Once the red fills, it'll block off and all the extra sugar will pour to the right (if you block off the left) and you just need to direct that into the blue filter then the blue cup. Now you need to basically sever the left side and focus on the green. do green similar to red, and you should be fine. Now with purple, because the white sugar is going to be pouring past the purple and will have to loop back, your best bet is to make it so that the sugar is freefalling above the left edge of the cup. some will go in, and the rest you make go down to the purple filter, and dump in with the white sugar. Slowly, you should fill up the purple, but there is a limit on this level for amount of sugar (its fairly high, but you dump a lot of white into the purple) so try to do the first three cups efficently. Beautifully designed, nicely balanced and a pleasure to play. I wish there was an erase button, or a straight-line tool. Too often crooked lines would cause unwanted errors. I guess erase would make some levels too easy, but restarting and waiting for the flow because of a bump makes me question my use of time. There is one really annoying glitch in this game. Sometimes the line continues to draw when you let go of the mouse button, and sometimes it doesn't. I love that you never run out of 'ink' to draw ramps with. Instead of sitting around doing nothing or something in another tab waiting for the sugar to reach the cup at its leisurely pace, you are free to draw, for example, the kool-aid man bursting out of the level background off in an unused space. I know it's pretty sad but I'm having troubles with level 4. Help please? I want more levels! freeplay isn't very exciting with no cups to fill or gravity buttons. I used up all the levels and I still want more. Pleas make a Part II asap. This is really fun, although a speed up function would be nice. I like how it's totally unique, not just a slightly different version of an existing game, like so many of the 'new' games are. How do you get through level 20? if u let the sugar flow long enough will it pile up and go above the cup ? is there another game like it? i beat it like five times...make another one plz! I'm stuck on level 4 - how do you get the sugar to go up??? Apparently, the screen wraps round bottom to top (although I don't remember seeing this mentioned anywhere). Let the sugar flow through the hole at the bottom and then catch it to pour it into the cup on the left. I don't know how to get past level 8. Could I get help please?